Established in 2013, Outcomes LLC provides the $500 billion pharmaceutical industry with need-to-know business information. In September 2007, Engel Publishing Partners was acquired by Canon Communications LLC and in October 2010, Canon Communications was acquired by UBM and in January 2014, PharmaLive and Med Ad News brands were acquired by Outcomes LLC. 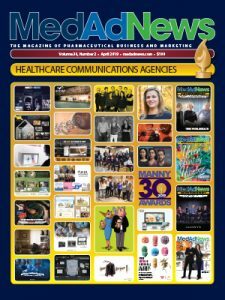 In this capacity, we continue our tradition of disseminating original, thought-provoking content with the intent of providing the busy pharmaceutical executive with insight into industry trends that will affect their business, as well as the industry in its entirety. SUBSCRIBE FREE today! Written primarily by our editors and staff reporters, our products provide broad coverage of pharmaceutical business, product marketing, and clinical research. Our business-news magazine, Med Ad News, provides readers with business intelligence that will impact their company’s performance. Med Ad News, launched in 1982, has been the magazine of choice for insight into successful business and marketing strategies. We offer a multitude of Web-based products designed to keep the busy pharmaceutical executive current on news and events. Through our industry leading Website, PharmaLive.com, and e-mail-based newsletters, including Daily Advantage and Medicine Avenue, readers can receive information deemed critical to their role. To provide business executives with a forum for interaction, we host our annual Manny Awards, celebrating excellence in creativity surrounding the marketing of health and wellness. Events provide attendees with the opportunity to meet industry leaders, understand successful business strategies, and gain insight into issues affecting the industry currently, and in the long term. Interested in collaborating on content or advertising? Review our editorial calendar or contact us today!